^ "CWorld | Christopher Ward | QUARTZ VS AUTOMATIC". www.christopherward.com. Retrieved 27 November 2018. 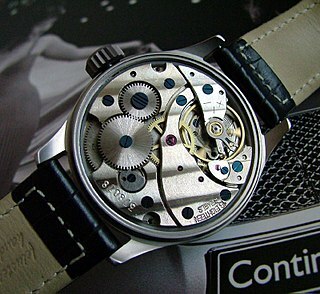 ^ "What is a Watch Movement? Quartz vs Automatic vs Manual vs Kinetic | Est.1897". est1897.co.uk. Retrieved 27 November 2018. ^ a b "Four Revolutions: Part 1: A Concise History Of The Quartz Revolution - HODINKEE". HODINKEE. Retrieved 27 November 2018. ^ a b "A Concise History of the Quartz Watch Revolution". www.bloomberg.com. Retrieved 27 November 2018. ^ "Mechanical Watches Almost Disappeared Forever. Here's How They Didn't". www.bloomberg.com. Retrieved 27 November 2018. ^ Adams, Ariel. "$24,000,000 Patek Philippe Supercomplication Pocket Watch Beats Its Own Record at Auction". Forbes. Retrieved 23 November 2018. ^ "Swiss Pocket Watch Sells for Record $24 Million". Time. Retrieved 23 November 2018. ^ "Patek Philippe gold watch sells for record $24.4M - CNN". CNN Style. 12 November 2014. Retrieved 23 November 2018. ^ "World's most expensive watch sold". BBC News. Retrieved 24 November 2018. 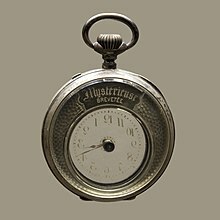 A pocket watch is a watch that is made to be carried in a pocket, as opposed to a wristwatch, which is strapped to the wrist. Seiko Holdings Corporation , commonly known as Seiko, is a Japanese holding company that has subsidiaries which manufactures and sells watches, clocks, electronic devices, semiconductors, jewelries, and optical products. In horology, a movement, also known as a caliber, is the mechanism of a watch or timepiece, as opposed to the case, which encloses and protects the movement, and the face, which displays the time. 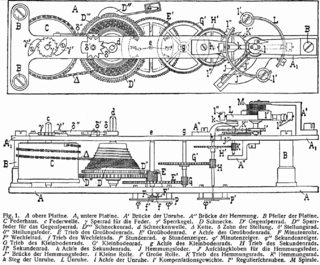 The term originated with mechanical timepieces, whose clockwork movements are made of many moving parts. It is less frequently applied to modern electronic or quartz timepieces, where the word module is often used instead. 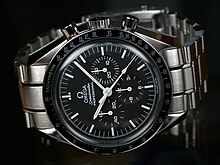 A chronograph is a specific type of watch that is used as a stopwatch combined with a display watch. 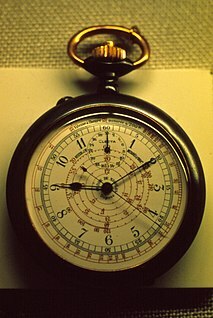 A basic chronograph has an independent sweep second hand; it can be started, stopped, and returned to zero by successive pressure on the stem. More complex chronographs use additional complications and can have multiple independent hands to measure seconds, minutes, hours and even tenths of a second. In addition, many modern chronographs use moveable bezels as tachymeters for rapid calculations of speed or distance. Louis Moinet invented the chronograph in 1816 for use in tracking astronomical objects. Chronographs were also used heavily in artillery fire in the mid to late 1800s. More modern uses of chronographs involve piloting airplanes, car racing, diving and submarine maneuvering. Swatch is a Swiss watchmaker founded in 1983 by Nicolas Hayek and a subsidiary of The Swatch Group. 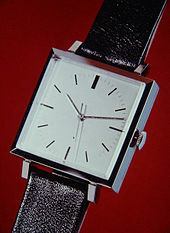 The Swatch product line was developed as a response to the "quartz crisis" of the 1970s and 1980s, in which Asian-made digital watches were competing against traditional European-made mechanical watches. In horology, a tourbillon is an addition to the mechanics of a watch escapement. 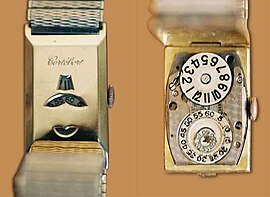 It was developed around 1795 and patented by the French-Swiss watchmaker Abraham-Louis Breguet on June 26, 1801. In a tourbillon the escapement and balance wheel are mounted in a rotating cage, in order to negate the effects of gravity when the timepiece is stuck in a certain position. By continuously rotating the entire balance wheel/escapement assembly at a slow rate, the tourbillon averages out positional errors. The Hamilton Watch Company is a Swiss manufacturer of wristwatches based in Bienne, Switzerland. The Hamilton Watch Company had its genesis as an American watch design and manufacturing company, which incorporated in 1892 and produced its first watch in 1893. The Spring Drive is a watch movement conceived in 1977 by Yoshikazu Akahane at Suwa Seikosha. 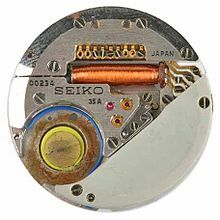 Specified to one second accuracy per day, the movement uses a conventional power train as in traditional mechanical watches, but rather than an escapement or balance wheel, instead features Seiko's Tri-synchro Regulator system in which power delivery to the watch hands is regulated based on a reference quartz signal. Citizen Watch Co., Ltd. is an electronics company primarily known for its watches, and is the core company of a Japanese global corporate group based in Tokyo. In addition to Citizen brand watches, it is the parent of American watch company Bulova, and is also known for manufacturing small electronics such as calculators. The history of watches began in 16th century Europe, where watches evolved from portable spring-driven clocks, which first appeared in the 15th century. The watch which developed from the 16th century to the mid 20th century was a mechanical device, powered by winding a mainspring which turned gears and then moved the hands, and kept time with a rotating balance wheel. The invention of the quartz watch in the 1960s, which ran on electricity and kept time with a vibrating quartz crystal, proved a radical departure for the industry. During the 1980s quartz watches took over the market from mechanical watches, an event referred to as the "quartz crisis". Although mechanical watches still sell at the high end of the market, the vast majority of watches now have quartz movements. Automatic quartz is a collective term describing watch movements that combine a self-winding rotor mechanism to generate electricity with a piezoelectric quartz crystal as its timing element. Such movements aim to provide the advantages of quartz without the inconvenience and environmental impact of batteries. Several manufacturers employ this technique. A mechanical watch is a watch that uses a clockwork mechanism to measure the passage of time, as opposed to quartz watches which function electronically via a small battery. A mechanical watch is driven by a mainspring which must be hand-wound periodically. Its force is transmitted through a series of gears to power the balance wheel, a weighted wheel which oscillates back and forth at a constant rate. 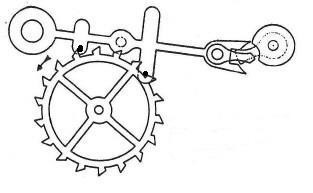 A device called an escapement releases the watch's wheels to move forward a small amount with each swing of the balance wheel, moving the watch's hands forward at a constant rate. This makes the 'ticking' sound a significant characteristic of all mechanical watches. Mechanical watches evolved in Europe in the 17th century from spring powered clocks, which appeared in the 15th century. 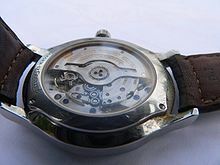 The quartz crisis is a term used in the watchmaking industry, referring to the economic upheavals caused by the advent of quartz watches in the 1970s and early 1980s, which largely replaced mechanical watches around the world. It caused a significant decline of the Swiss watchmaking industry, which chose to remain focused on traditional mechanical watches, while the majority of the world's watch production shifted to Asian companies such as Seiko, Citizen and Casio in Japan that embraced the new electronic technology. In horology the term electric watch is used for the first generation electrically-powered wristwatches which were first publicly displayed by both Elgin National Watch Company and LIP on the 19th of March 1952 with working laboratory examples in Chicago and Paris. Hamilton would be the first to produce and retail an electric watch beginning in 1957, before the commercial introduction of the quartz wristwatch in 1969 by Seiko with the Astron. Their timekeeping element was either a traditional balance wheel or a tuning fork, driven electromagnetically by a solenoid powered by a battery. The hands were driven mechanically through a wheel train. They were superseded by quartz watches, which had greater accuracy and durability due to their lower parts count. Recent automatic quartz watches, which combine mechanical technology with quartz timekeeping, are not included in this classification. 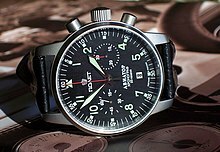 Gallet (ˈgæl.eɪ) is a historic Swiss manufacturer of high-end timepieces for professional, military, sports, racing, and aviation use. Gallet is the world's oldest watch and clock making house with history dating back to Humbertus Gallet, a clock maker who became a citizen of Genève in 1466. The Gallet & Cie name was officially registered by Julien Gallet (1806–1849) in 1826, who moved the family business from Geneva to La Chaux-de-Fonds, Switzerland. Prior to this date, operations commenced under the name of each of the Gallet family patriarchs. 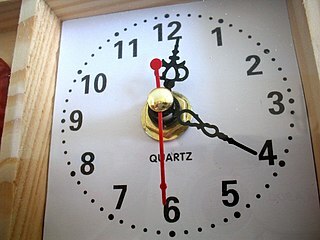 A quartz clock is a clock that uses an electronic oscillator that is regulated by a quartz crystal to keep time. This crystal oscillator creates a signal with very precise frequency, so that quartz clocks are at least an order of magnitude more accurate than mechanical clocks. Generally, some form of digital logic counts the cycles of this signal and provides a numeric time display, usually in units of hours, minutes, and seconds.